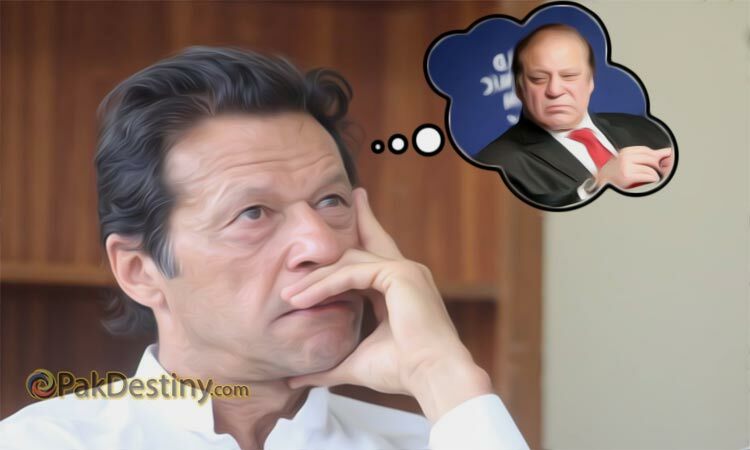 (Pakdestiny) PTI Chairman Imran Khan this time is optimistic that he will get Prime Minister Nawaz Sharif removed in the wake of his alleged corruption in Panamagate scandal. “Mr Khan is not thinking about failure of 2014 sit-in. He has left behind this and moves ahead to get Sharif this time,” a PTI leader close to Khan told Pak Destiny. “If we fail to get Sharif this time it means he will emerge even more stronger after 2018 elections and establishment too will be under him,” he said. On the other hand Imran Khan manages to put up good show in Lahore on Saturday. He was so up beat that he demanded: “Nawaz Sharif’s name should be placed on ECL till the conclusion of the probe into his family members’ off shore holdings revealed in the Panama Papers. The Supreme Court should order placing his name on the ECL,” Khan said while addressing the rally, adding, Sharif will be in jail when he comes to power. Imran Khan further said his party would march towards Sharif’s Raiwind residence after Eidul Azha (this month) if he (Nawaz) fails to respond his four questions about making assets abroad.”Nawaz must tell the Pakistani nation how he made billions of rupees and then transferred it abroad. How much tax he paid on the money through which he purchased apartments in London,” he said. Khan said if Nawaz Sharif thinks he will get away from Panama Leaks, he is seriously mistaken. “Panamagate will not leave Nawaz Sharif,” he said. Khan also urged the heads of National Accountability Bureau (NAB), Federal Board of Revenue (FBR) and Federal Investigation to act and start probe against Nawaz Sharif and his family members for their off-shore holdings. He also declared Election Commission of Pakistan (ECP) a B-team of ruling PML-N. He said Nawaz Sharif wants the Panama Papers issue to be investigated according to laws dictated by his government. “Along with militant terrorism, Pakistan is also facing economic terrorism,” he said, adding the PML-N is destroying the institutions to avoid accountability. “I warn the monarchy of Sharifs that our protest is peaceful, so they better not provoke us,” he said. اگرپاکستان کےالیکشن پوری دنیاکےانگریزی بولنےوالے افراد ( انگریزوں)میں هوتے توعمران خان پوری دنیا کے انگریزوں کا مشترکه وزیراعظم هوتااور اگر یهی الیکشن لندن میں هوتے تو عمران خان انکھیں بند کر کے جیت جاتا، مگر پاکستان میں زیاده عوام پڑهے لکھے نه هونے کی وجه سے عمران خان جیت نه سکا . “Ghr ko aag lg gai ghr k chirag se” The situation of KPK is worst now a days but Respected Imran is busy another “activities” Sir ap KPK he rahyn wahan terrorist activities ko rokyn pehly. but if the properties were bought in 93-96(according to bbc report and their own dubious statements) when his children were not even working or earning how can they buy them? they are saying we bought it in 2005 than why cant they show the sale and purchase deeds of when an from whom they bought it? whats so difficult in that? dont tell us from where the money came just only prove they were bought after his children started earning simple as that. This is the problem with Imran Khan. Everyone who doesn’t work according to his will or who doesn’t impose judgements as wanted by him is corrupt or an ally of Nawaz Sharif. This isn’t supposed to be the behavior of a mature politician. Grow up man ! Imran Khan has been in politics for 20 years now.A period,definitely,more than his cricketing career.His leadership or rather aptitude to be a political or public leader must be analyzed now and this scrutiny must be close,comprehensive and total.Often,he is seen roaring against the corruption and Nawaz Shariff.No fault with that as high-place corruption must be rail against.But,where he has failed in,is his inability to declare a road map which contains his vision and aspirations for people of Pakistan.Women and youth are the biggest component of this subcontinent’s society.What this ex-pacer has for them?Pakistan see lot of honour killings and the women face discrimination,oppression and torture at home and outside.Similarly,the youth awaits someone who bring gainful employment opportunities for them and make them realize their potential.I may be wrong but,hardly,did I see any vision or promise for them in Imran’s policies and programmes.Mere chiding a polical establishment for its massive corruption is not going to help matters.Remember,a corrupt deal,always,involve two benefiting sides and both have their interests served by this corrupt practice.For example,a traffic cop, escaping you from legal clutches when you were found driving without driving licence and registration papers of the vehicle,carrying a legal penalty of Rs.1000/-in exchange of Rs.100-200.You saved yourself not only Rs.800-900/-but also a full day marathon at the court-room,with an absence from your office or shop.Can you abuse or denounce that”Meharbaan”police man?NO.Or,your tax-liability reduced by Rs.10,000-20,000/-by the tax authorities,after taking just Rs.3000/-.NEVER,ever,you are going to report that”friendly gesture”of that “kind-hearted”official.Then,where has Imran Khan,any place in that cosy scheme of things where the beneficiary as well as the favour-maker have mutual interest or concern?We can replicate hundreds of such small examples on larger and bigger deals and Imran’s objective comes to a cropper.Therefore,it is high time that he broadens his vision and make it comprehensive.And,what better segment other than women or youth or both to see some hope for them in it?If he does not do so,unfortunately,2018 Elections,too,are not going to be different to him.Be practical,contemplative and less noisy.Be more serious,thoughtful and statesman.Remember,a political career is not like a 20-20 match where the ace speedster has to bowl,just,first two overs and then return only in the dying moments of the innings.It is like a Test Match where one has to bowl well into the initial lunch-session and make inroads into the opposition ranks.Shukria. Imran Khan makes it clear answer 4 basic questions about your foreign properties before Eid or be ready for Raiwand March.Much delay already has been made,Now it time to do some real action.Does a Man who hidden his assets from his nation,a Man who lied his nation,a man who contradicts his claims,a man who doesn’t has clear financial record,is blamed of being financially corrupt,a man who rigged election does he deserve to be PrimeMinister of an Islamic Republic? Either he’ll be made accountable or this country will turn into banana Republic where laws are made to persecute weak and privilege elite.Its now or never. عمران خان کے بس میں کوشش ہیں جو وہ پوری ایمانداری کے ساتھ کررہا ہیں کامیابی انسان کے بس میں نہیں .عمران خان کامیاب ہو یا ناکام اسکی عزت میں کوئی فرق نہیں ہوگا ہم ان کے ساتھ ہیں چاہیے نتجہ جو بھی ہو..